With fall and winter just around the corner, many of us will start spending a bit more time in our yards preparing for the harsh weather ahead. This usually includes cleaning out gutters, cleaning debris off the roof of your home, and of course, making sure the home is weatherproof for the winter. One thing we often overlook is the cleaning of our AC units outside! While not much effort is needed, a good cleaning should be done on the A/C condenser twice annually, and it never hurts to rinse it off after each yard mowing throughout the year! In fact, a dirty condensing unit is one of the reasons central ac blows hot air, so it’s a great way to prevent breakdowns as well. This DIY Article is going to walk you through a quick and easy cleaning of your outside condensing unit. 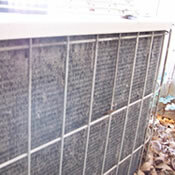 In this article, we walk through a DIY Cleaning of the A/C Condensing Unit Coil outside. It will only take 15-30 minutes for a thorough cleaning, a clean AC unit saves energy and might just add an extra year or two onto the life of your complete home cooling system! Lets get started cleaning our condensing unit.The cleaning method below only needs to be done twice a year. During the rest of the year, you should simply rinse off your condenser after each lawn mowing. We need to disconnect the power to the outdoor unit. Find the thick power cable that is connected to the AC unit and follow it to the Electricity Disconnect Box. These are usually located within 4-8 feet of your air conditioner. Once you find it, turn the breaker to the OFF position, or remove the power disconnect completely. With the power off, use your adjustable wrench or a socket and remove the 4-8 bolts that fasten the fan motor and grill to the top or side of the ac condenser. Carefully lift off the fan motor and set it to one side. Reach inside the condensing unit and remove all large debris like leaves or small twigs that will not fluch out the sides. Spray the foaming cleaning on the inside and outside of the coils, and let it sit for 5-10 minutes. Thoroughly rinse off the coil, inside and out, making sure all debris is cleaned off and the coil is clean. Reinstall the fan motor and guard to the top or side. Do not over-tighten the bolts! Inspect the copper tubing insulation and thermostat wires, making sure they are intact and in good shape. Reconnect the power to your system, by turning on the breaker. With any kind of project, even the simplest of things can have a danger attached to them! Cleaning your home AC condensing unit is no different! Electricity can kill you! Make sure you disconnect the power! Beware of snakes and spiders, they have been known to live in or around condensing units! Wear gloves! The aluminum fins on the side of the condensing unit are razor sharp! Wear safety glasses! They do not transplant eyes! Use care and caution when cleaning unit, the aluminum fins are very sensitive and MUST remain as open as possible! Common sense rules with any home project. If it looks like it may be dangerous, it probably is! 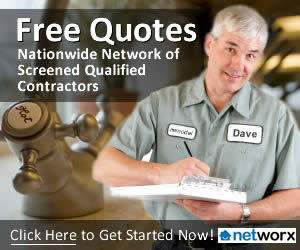 Always remember that there are some things left to a trained technician as well! If you notice anything that looks like it may need a more intense inspection (corrosion, frayed electrical, etc) from a seasoned professional, Eddie from B&E AC and Heating in Charlotte NC suggests you call a HVAC contractor. In most cases, if it looks like something is wrong, it usually is. Comments and Tips Always Welcome!